Umezawa Gallery: Rimpa, 1970, cat. 16, pl. 1-12. Shimane Prefectural Museum: Hatsukokai Umezawa kinenkan meihinten zuroku, 1984. Shikosha: Rimpa, Kyoto, 1991-92, vol. 3, pls. S11-1, S11-2; vol. 4, pls. 211, S8-2, S8-3; vol. 5, pl. 43. 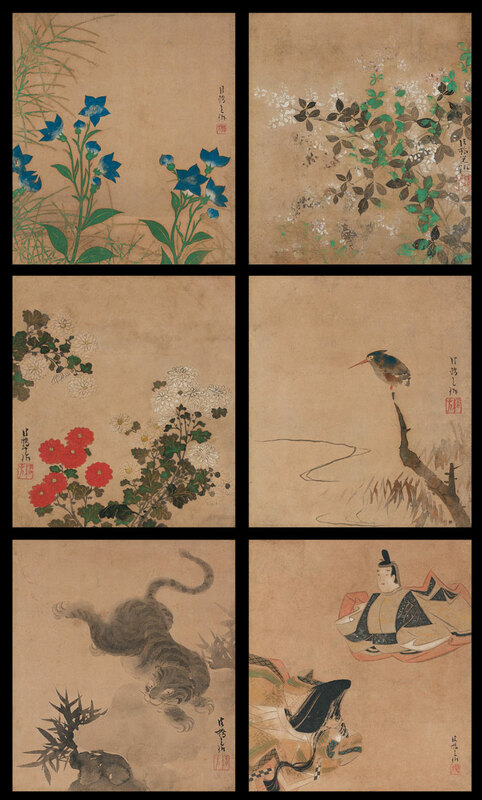 This album, presently formatted into two albums of six leaves each, is reportedly half of a twenty-four-leaf album that was discovered shortly before the Umezawa Gallery acquired its twelve leaves. Why, and by whom, the album was divided is not discussed by the authors of the 1970 catalogue in which the album was introduced. Each of the leaves is signed with the hokkyo title Korin received from the court in 1701, so the works must date no earlier than that year. The wide variety of subjects and approaches suggests a conscious display of technical and aesthetic prowess, perhaps a celebration of his new status by a still youthful and most creative and experimental artist. Ogata Korin (1658-1716) and his younger brother, the potter Ogata Kenzan (1663-1743), were born in Kyoto, sons of the wealthy merchant Ogata Soken, who had a taste for the arts. The Ogata family trade was designing and selling fine textiles, and their shop, the Karigane-ya, catered to the most elegant and aristocratic women in the city. Soken was a calligrapher of note, working in the style of Koetsu (1558-1637), as well as a textile designer and patron of the No theater. The family connection with Koetsu was close; Soken’s grandfather, Ogata Dohaku, had married Koetsu’s sister, and the Ogata family maintained a house in the colony for artists founded by Koetsu at Takagamine in Kyoto. Soken’s father, Sohaku, built the success and fame of the shop through service to such high-ranking clients as the Lady Tofuku-mon-in, daughter of the Shogun and consort of the Emperor. Korin was the second son of Soken, and Kenzan the third, born five years later. In the formulation of John Rosenfield, the two brothers were like the proverbial ant and grasshopper, differing radically in temperament. Korin had been trained in textile design and in the Kano style of painting. He was clearly a youth of the highest degree of talent and promise, but apparently dissipated his talent in a taste for Kyoto high life. His father had died in 1687, leaving a generous inheritance, but he squandered this, and through his lack of concern for business, the Karigane-ya went into bankruptcy. Studying first with Yamamoto Soken (active ca.1683-1706), then under Kano Tsunenobu (1636-1713) and Sumiyoshi Gukei (1631-1705), Korin used Koetsu and, especially, Tawaraya Sotatsu (?-1643?) as his main sources of stylistic inspiration. In 1701 he was granted honorary ecclesiastical rank as hokkyo (‘Bridge of the Law’), the highest honor that was accorded to lay artists. 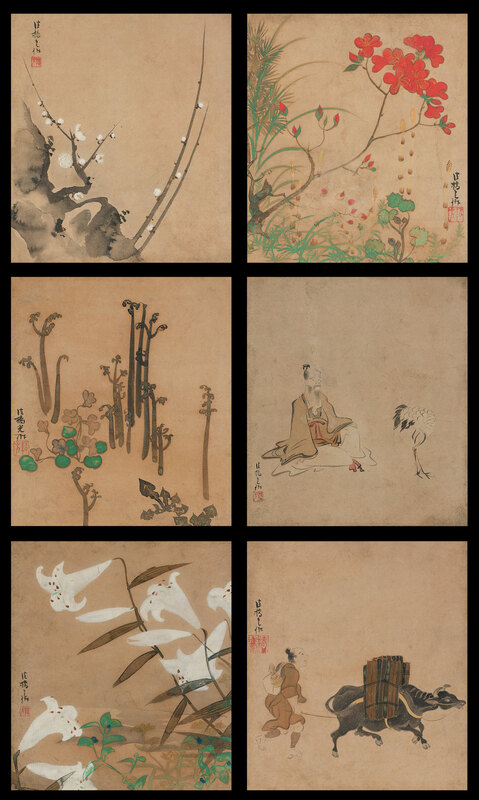 The present album demonstrates the immense talents of this artist, who worked with great originality (even when following Sotatsu, for example, in leaf 6 with the ox-herder) in combining acute observation of natural forms with abstract designs to create compositions of great and immediate expressive force. 1. Umezawa Gallery: Rimpa, 1970, catalogue entry 16. 2. John Rosenfield and Shujiro Shimada : Traditions of Japanese Art, Cambridge, 1970, p. 273.